Salmoneus is the name of my character in RuneScape. This page is essentially an "About Salmoneus" page, with details about my stats, goals, favourite outfits, and a bit of info about me. Check out my Adventurer's Log for my most up-to-date stats and recent achievements! I need to catch up on all of them! 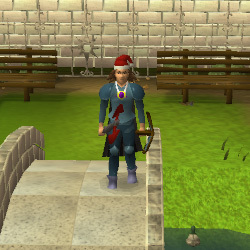 I can usually be found wearing one of the following outfits in RuneScape. Sal, without any equipment or extra accessories. Is your real name "Salmoneus"? How often do you play RuneScape? Whenever I have time. 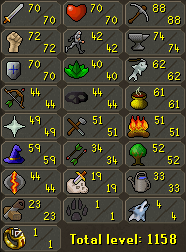 I haven't really been active in RuneScape since late 2005, but I plan to start becoming active again soon. 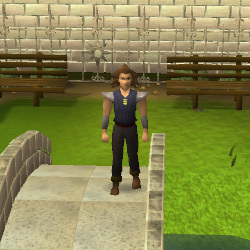 What is your favourite thing to do in RuneScape? I really enjoy mining. Usually I'll just listen to some of my favourite music and mine for hours. It's back-breaking work, but it's fun and profitable! When I'm not mining, I love playing Castle Wars. The thrill of capturing the flag and running across the battlefield is exciting! What is your favourite item in RuneScape? That's easy -- a Santa Hat! 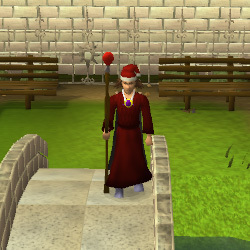 How many Santa Hats do you own? When did you start playing RuneScape? I began playing in May 2001. A friend of mine did a school presentation on the game, and it really interested me. I went home to check it out, and I instantly became fascinated with it. RuneScape was my first MMORPG, and it is by far my favourite so far. My main method of making money in RuneScape is with the tried-and-true method of smithing Steel/Mithril Platebodies and High Alchemizing them. Because I mine all the ores and craft all the runes myself, it's all profit! There are probably far better ways, but since Mining is my favourite skill, I might as well put those ores to good use! How and why did you create this website? I created this website back in 2001 to help players "find their way" in RuneScape. Back then, there was little information about the game (no introduction quest/task/island, Quest Help didn't exist, and there were few "how to..." guides out there on the web), and I really wanted to change that by sharing what I had learned since I began playing. The site was originally hosted by various free hosts which offered a "page editor" feature. Eventually the site was moved to a paid host and I learned HTML and CSS so that I could have full control over how the site looked. What other programming languages to you know? Now that the website has been redesigned, more attention can go towards the various projects we have been planning. This includes Monster and NPC databases, a Treasure Trails database, multilingual content and a slew of other neat tools, services and features!